There are more and more pet owners today turning to a raw diet for their dogs. Why is this? Generally it is because they would like to see their dog eat something that is more like what he would typically eat in the wild. It is also because more people are becoming aware of the poor nutritional value of many of the commercial dog food brands today. Unless you buy a high end dog food that has no corn in it then you may want to look at the ingredients on your bag of kibble. More than likely one of the top ingredients will be corn which is a known allergen to dogs. For this reason pet owners are enjoying the idea of feeding raw foods to their trusted fur friends. It is important to point out that there are some misconceptions where chicken bones are concerned. First let us start by saying that cooked chicken bones are an absolute no-no for dogs as they will splinter and could cause injuries. However, raw chicken bones are soft and therefore quite safe for dogs. Consider dogs in the wild and how likely they might be to hunt for, kill and eat an entire bird. Do you think these dogs are eating something that they really should not? More than likely they know more about what is good for them than we do. Somehow humans have developed the erroneous opinion that dogs would be lost without us. While it is true that domestic dogs will eat things like chemicals and cleaning agents that they should not, we are focusing primarily on what dogs in the wild would eat. Their food would be raw and certainly not in the form of kibble. Any time you rapidly change your dog’s diet you risk the occurrence of pancreatic problems. This is because a dog really needs an adjusted period to diet changes. This means that you should start any and all changes slowly. Do not be so fast to toss the kibble in the trash and start throwing raw chickens and carrots to your dog instead. You will want to begin slowly. Start by incorporating a couple of small raw chicken wings in your dog’s regular diet. Continue to do this until you are able to gradually switch completely to raw foods. This process will not happen over night and the diet change should take weeks to complete. 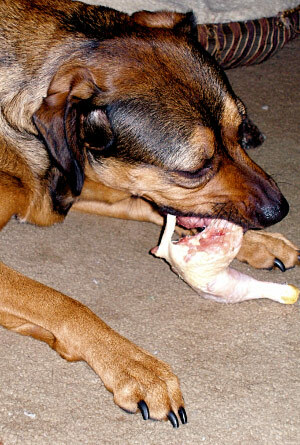 Some people are petrified to feed their dogs raw chicken because they are afraid of the bacteria that is present on raw chicken. The truth is this is ridiculous and should not even be a consideration. Dogs are made with an incredible immune system and loads of friendly bacteria that are specifically designed to allow them to eat raw food. You would never feed your human child raw chicken but if your child is covered in fur with four legs and tends to bark at strangers then raw chicken for him is more than okay, it is ideal. You can however rinse the chicken before you feed it as their may be undesirable chemicals sprayed on the chicken before packaging. Some people who feed raw diets to their dogs insist on giving their dogs a specific amount of grains and vegetables. This is, to put it nicely, hog wash! Dogs do not need these things as they are carnivores through and through. In fact some grains, fruits and vegetables may even be harmful to your dog. Once you have made the switch to raw food you will want to feed raw chicken, lamb, pork, fish and even small cuts of beef. In addition, your dog will surely thank you for some nice raw innards and organs. Do your dog a favor, do not subscribe to the idea that he would benefit from anything other than meat. The truth is a complete diet for a dog is a diet that is high in protein and pure meat. Anything else is senseless. With this being said raw eggs are also wonderful for dogs and the great thing is you can feed him the eggs right in the shell. Many vets are of the opinion that kibble is better. This could be for a number of reasons. Have you ever noticed that your vet usually sells a specific brand of dog food on his shelf? This is because he gets a kick back from that company for selling that brand. If you have a vet who does not understand the nutritional value of feeding your dogs a diet that is as close to what they would eat in the wild then you can do one of two things. You can either request that your vet go back for a couple of more years of education or you can switch vets. Dogs that are fed raw diets have a tendency to be generally healthier than dogs that are given strictly kibble. The biggest challenge for you when switching your dog to raw foods will be how much to feed. It is hard to determine how much food to feed your dog when there are no instructions on the carcass! Generally speaking the amount to feed will depend on the size of your dog and his energy/exercise level. A sedentary dog that lays around the house for most of the day will not need to eat as much as a high energy dog who runs and plays in the field all day. In addition, a twelve pound dog will not eat as much as an 80 pound dog. You will have to figure out about how much to feed each of your dogs based on these factors but as a rough estimate let us say you have a 60 pound boxer dog. He can eat a quarter to a half a chicken per day as well as a few various pieces of other meats quite easily. If you have a toy poodle he may eat a few chicken wings a day. You do not have to over feed your dogs. Remember in the wild dogs may only eat once every other or even every third day. If your dog is thriving and maintaining a healthy weight then you are feeding the right amount. I gave my adult dog, (australian cattledog) raw chicken wings for the first time, the bones splintered, now what?? Help. If you are buying whole live chickens for your large breed dogs then just put the chicken in the backyard with the dog and let him go at it. If you live in the country this is awesome for your dog! YOU PSYCHO!!! What so your dog learns to attack small animals and possibly children. Very informative! I saw the trainers feeding their dogs raw chicken & was not sure of the benefit. After reading your post I feel more informed & might just start feeding my dogs raw chicken once or twice a week as a treat. We have been feeding our GSD raw chicken wings and poultry necks since we rescued him at the age of 2. Then he was being fed tinned food and dry biscuit and had constant diarrhoea. Now he has perfect poos a beautiful shiny coat, moults very little and has lovely teeth. Recently we bought a terrier puppy who was being fed a dry kibble. As soon as she saw what our shepherd was eating she went crazy for it and wouldn't go anywhere near the kibble. Now she is on the same diet and is a healthy happy and very lively pup. Can't recommend the natural diet enough. This was a good article full of common sense that today's social pet circle fails to recognize. Marketing propaganda and pet commercials have brainwashed viewers into believing that a pets diet is equal to a humans needs and should therefore consist of our own dietary requirements and supplements as to sustain a healthy lifestyle. The latest is buffalo which sells for about 50.00! Buffalo is marketed with blue berries and other berries as a health benefit "fit for your dog"! I have two blueberry bushes and tons of wild black berries each year, I have not once seen my lab or any of the neighbouring dogs in the area filling their stomachs on such. Of course I have not said anything you have not said already… Kudos. Now if we can just get all dog food manufactures to offer these facts to the public. Thanks for the backup. My husband is one of those people who is "afraid of the bacteria that is present on raw chicken". I asked him who he thought was cooking for dogs prior to their domestication. Glad to get another dog lover's opinion to back me up! I disagree about giving dogs grains, vegetables and fruit. I feed three very large dogs with cooked rice, and ground chicken (bones and all) and vegetables. I make my own yogurt… so I add whey… also olive oil and limited amounts of raw eggs. Also their favourite treat… cut up apples…. So, I must strongly disagree with you and I do believe it is not hogwash. If my dogs are allowed in garden, they will eat what they find… proving to me that know they want other types of food other than meat. I was hoping to find some information that presents the pros and cons to switching to a raw diet for my dog. I know there may be some certain things to avoid, but this article was much too biased and seemed to almost discredit anything other than a raw diet which is poor information to provide people. Corn is not an known source of allergens in dogs, and it is a highly digestible source of protein, vets DO NOT GET KICK backs and yes they sell food that have been studied and tried in actual dogs and therefore actually meet the claims they make. You cause your dog great risk for disease not providing a balanced diet. And yes wild dogs eat grain!! THEY ARE NOT TRUE CARNIVOIRES!! Their diet is mainly herbivores and what do you think happens when they kill say a rabbit with a full belly? They in turn digest the plant material that came on board with the rabbit!! Wild dogs also eat berries in their natural environment. Feeding raw is a definite option but few people have the smarts and dedication to properly formulate a complete diet and are short changing their dog of optimum health. Most raw diets are severely lacking in calcium and way too high in phosphorous and in a senior dog that will ruin their kidneys prematurely. Your recommendations of just meat is going to kill your dog prematurely from lack of a balanced diet!!! Learn a few things before you publish these things, and my God have mercy on your dogs and them life a healthy life despite your closed mined uneducated decision on the most important factor of their health quality!!! Thank you, wanted to know if I could feed my sister's dog raw chicken – dog is usually fed kibble. Sounds like she's in for a treat! This honestly was a great article to read. Answered my questions, being one of those petrified dog owners. lol. Great Job! Thanks! I have just started to introduce raw chicken legs with kibble. Not sure if I will go completely raw food but I thought it might help clean the dogs teeth. I needed to be sure raw chicken was safe to feed my amazing dog. After reading the article, I know it is safe for him and will feed him some raw chicken to see how he likes it. Thank You for the information. I am so glad I read this because I was thinking of buying a meat grinder, because I wanted to grind the chicken bones. Glad to know raw bones are safe. I just have to work out how much to feed a 70 lbs Lab. Good advice and it had exactly the information about raw food I was looking to learn about, thanks! I wish you had cited some studies to back up your claims. After all, you're sort of calling vets, who have many years of training on this, idiots for disagreeing with you. They can back up what they say because they look at evidence. Are you looking at evidence or spouting what you believe to be common sense? Finally someone who simplifies a confusing subject. I have a very picky dog who will only eat beef neck bones, chicken backs or spines and tripe / liver on a consistent basis as well as eggs and even my holistic vet has pushed me to try to get her to eat other things (veggies/fruit) and expressed an opinion that she is nutrient deficient so I now give her a vitamin/calcium/mineral supplement. I feel extremely stressed that I'm not feeding her right and buy into trying other things which makes my dog refuse to eat at all. Doesn't help that she will also skip meals then eat great again! Being worried about giving bacteria to your dog is far from ridiculous, and the same goes for worrying about bones splintering. You are a writer, not a trained vet – and provide absolutely no links to scientific evidence that dogs on raw food are healthier than dogs on kibble. This is irresponsible writing at best, and dangerous at worst. Love this article. As a loving pet owner and one who works my dogs both physically and mentally, diet has been a question I can't get a straight answer on. My dogs are a German Shepard ad a McNab. Both run and do around 4-6 miles 5 days a week with me. Plus swim, fetch and wrestle. So a raw diet really interests me as well as the cost being very comparable to a expensive brand of kibble like Blue Buffalo or Evo. Really the biggest concern is the bacteria. What I don't know scares me especially when it comes to my animals being fed. If you have any other articles with good secondary research, I would really appreciate that. Thank you for this article and helping bring peace of mind to my question regarding bacteria and a raw diet. This is a good article and validates my opinion! Concise and very helpful – much appreciated. My Black Mouth Cur is allergic to everything including carrots. I want to switch to raw chicken (she's allergic to beef). Do I need to add any other nutritional sources (no rice or sweet potatoes, also allergic)? Completely wrong on all points. Corn is not an allergen to all dogs, just a few. The same way peanuts are an allergen to only some people. Also a raw meat only diet leaves many nutrients out of the equation, just as you or I would be malnourished if we ate only chicken. Some pet foods are lacking in research, but the good ones like Hills or Purina, among many others, have done millions of dollars of research to make sure your pet gets wonderful balanced nutrition. Vets study nutrition extensively and understand that it is crucial to a pet's health. That is why we provide or recommend foods for you feed that we have studied and know are the healthiest option available. Also, we understand that some people want a more natural or raw diet for their pet. If that is the case there are recipes for homemade diets that are fully balanced we can help you find or store bought brands we can recommend that provide natural or raw options. Please ask you vet about the best diet for your pet, we have studied it extensively and want them to live a long and healthy life! Prior my Tzu Crew, I had bred American Cocker's, my last Cocker lived just 4 months short of her 25th birthday. I am a blessed person to be sure as I am able to invest in my beloved dogs. I cannot say enough good about benefits of a balanced raw meat diet for dogs! Thank you for this article and providing a link for me to refer others to! Very helpful article. Makes perfect sense that dogs in the wild eat raw meat and bones. Us humans have become too domesticated! It would be great if you would post some scientific evidence, like real evidence, to back up your opinions. Believe me, veterinarians do not get kickbacks from pet food companies for selling their brands. Your validations are about as insightful as the people who say vegans are healthier than people who eat meat, again without supporting evidence to back up that opinion. Maybe spend a couple years in an animal nutrition class yourself before you start spouting animal advice. I'm going to assume you have never seen the repercussions from a dog/cat eating bones and suffering from an intestinal obstruction or perforation. It is awful to witness and expensive to correct. My issue is with your purely carnivore statement. Do you even own a dog? Your bio days you own three so I'm sure you've probably noticed them eating grass and other greens in your yard since you refuse to feed them anything other than protein. They need other vitamins and fibers too. Just like humans, dogs require a balanced diet. Can you tell us your educational background and share where you received degrees in nutrition and veterinary medicine? It is more difficult to receive a degree in vet med than human med in many cases, so I am sure you are highly qualified to give this advice. Please answer so we all can see that we are getting advice from a qualified expert. "Raw eggs, on the other hand, are not generally recommended for cats and dogs. Raw eggs do not impart any significant health benefit, and may only cause problems — issues of which are nullified by cooking the egg." This was taken from a very trusted source of information. There are many sources citing the same thing, yet this idiot that wrote this article said they are "wonderful" for your dog! He's just a conspiracy theorist that is basically telling you to leave your veterinarian because he claims they tell you things just for the fact they get kickbacks. There are other inconsistencies in this article, but we don't need to list them all. Folks, if you love your pets DO NOT listen to some uneducated, sensationalist with no degree in anything related to animals that thinks he should tell you what types of vets to go to and what food your dogs should eat. He even says that the vets should go back to school for a couple more years. What about you, Mr. Jorgensen? You've been to no schooling for animals whatsoever. "Sensationalism is a type of editorial bias in media in which events and topics in news stories and pieces are overhyped to present biased impressions on events, which may cause a manipulation to the truth of a story." What he wrote is an editorial bias, he overhypes certain things, and he most certainly causes a manipulation to the truth. He fits the definition to a T. Avoid any further articles from this dimwit. Incredibly biased and this is directly reflected in his writing style. He doesn't seem to be qualified to even be giving this advice. Yes vets will recommend a dry food based diet but that is because it is the best way to feed the animal exactly what they need nutritionally to support themselves. And feeding plants to animals is completely fine, as long as you understand what they shouldn't be eating. Although there are some good points your incredibly closed minded and that has totally discredited the article for me. I have a 10 month old GSD dog who is very good with my grandchildren. Will a raw diet make him ferocious as I don't want to change his good character? Cleared things up for me! Thank you for proving that dogs are carnivores and should be eating meat not grain. Although they do eat grass for digestive purposes… animals are smarter than we give them credit for. Now if my dogs start looking at my cat as a meal, I will worry then. My dogs are my life and I want to do what is best for them. Thanks for the article. This article is totally right. I used to feed my dogs (pitbull and chow chow) kibbles but totally changed to raw diet. They are now eating more and they seem to be healthier. In addition I didn't find any kibble brand that offers at least half the vitamins and protein found in raw diet. Off course now will come an idiot to say the opposite still I am always right about my dogs. Thank you, I feed my toy poodles and one of my cats raw washed chicken most meals and red meat when it is affordable & tuna occasionally & I wondered if it was too much chicken. I also give them necks but worry about too much fat so rip it off the outside of the neck before washing them. 1 of my bigger toy poodles is a little heavier but not fat so I wondered if it could too much chicken. Thank you for your article! He’s a bit strong on his opinions without providing any evidence. I am exploring a raw diet for my 95 lb Boxer (no he’s not fat, it’s his ideal weight, yes his ribs show a little, he is just a very big Boxer). If you state that studies show dogs on a raw diet are healthier than dogs on quality dog food (not commodity kibble) then cite those studies, we’d all like to see it. A raw diet may be great (as I said, I’m still investigating), but the way they ate in nature may or may not be the best approach for them to eat today. Worrying about the bacteria on chicken is not ridiculous. Ancient humans didn’t have antibiotics, however they have saved many lives (yeah, yeah, yeah don’t get me started on superbugs and some of the harm antibiotics have done, the point is, technology advances aren’t always worse than nature). It would be nice to see a neutral, scientific description on the pros and cons of a raw diet. This article isn’t that.